Claiming to support healthy bones and heart while treating hot flashes, night sweats and mood swings, it seems Nutrilite can truly help women who are going through the transitional stages of menopause. However, if this product is truly successful, why have very few reviews been written concerning it? Because very little information could be found about the success of Nutrilite, we must look at its mechanics to discover if this product could produce satisfaction. A company should always provide a complete list of all ingredients within a product. Customers have a right to know exactly what is in the supplement they are consuming. Users of Nurtilite should take three pills a day. However there is no indication as to when these pills should be taken, if they should be taken all together, and if food or water should be consumed along with them. A company should always supply information as to dosages for customers to review. Nutrilite can be purchased for $44.70. With each purchase, customers will receive 90 tablets; calculated with dosage, this is equivalent to a 30 day supply. There is no indication that customers can receive a discount when multiple bottles are purchased simultaneously. At first glance, customers may assume Nutrilite is accompanied by a 180 day 100% satisfaction guarantee. However, after reading the entire guarantee, it is revealed that it does not cover supplements and drugs. Therefore, Nutrilite is not backed by a guarantee. A guarantee should cover all of a company’s products. This provides a security element for customers. Based upon the information above, it seems Nutrilite encompasses many elements which should be of concern to future users. The first concern is ingredients. When a company does not post a full list of ingredients, customers cannot be sure they are getting a product that does not contain harmful ingredients or things which could cause an allergic reaction. By not being up front with all ingredients, a company creates the sense that they are attempting to hide information. A second concern is the fact that very little information is given concerning dosages. This creates another field in which Nutrilite purchasers will be left in the dark. A final element of concern is the guarantee. As stated above, guarantees create a safety factor for customers. Because a guarantee does not cover Nutrilite, customers are essentially risking their money on a product that may be unsatisfactory. 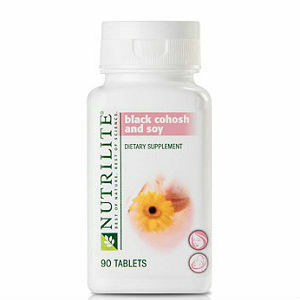 Jackie Horowitz	reviewed Nutrilite Black Cohosh And Soy	on March 28th	 and gave it a rating of 2.5.